When you are a theater company who does A Christmas Carol every year, you start thinking about Christmas in August--meeting with designers, getting the marketing plan in place, starting to build the show. By October you've already had a first rehearsal. And depending on when you are opening, Thanksgiving is a bit of a blur. For the Cliffside Theater Company this year, Thanksgiving is tech week. Not the most festive of times. Tech week is when lights are focused, wardrobe changes are rehearsed, press interviews are done on set, and if you're lucky you get a full run of the show done before the first audience comes in. Since Thanksgiving is early this year, our final dress rehearsal is actually scheduled for Thanksgiving night. I know, I know. How is that possible? Well, if things were going well, we could have had the final dress on Wednesday and taken the day off. But things aren't going well. At all. (Read A Christmas Peril for more details on that!) So we have to have Thanksgiving dinner at the theater. We're doing a pot luck for the feast, and the signups are interesting to say the least. Connie, our intrepid stage manager, has ordered a cooked ham and turkey and several pies to be delivered. Someone else is bringing roasted vegetables. The Beef and Ale is providing potatoes and green bean casserole. We have some Chinese food being delivered. Tofu is the prime ingredient in a couple of side dishes. Our rolls are going to be gluten free--don't ask. I'm even going to make my bourbon sweet potato casserole. I've already started to roast the potatoes, and will caramelize the brown sugar, butter, and bourbon on Wednesday night to let them all marinate together before I bake them on Thursday. Yum! Dinner is planned for two o'clock, in the lobby of the theater. The entire company will sit together, and share a meal. Maybe that will be the secret ingredient to make this our best A Christmas Carol ever. Let's hope so--t'is the season! I'm thrilled to kick off Killer Characters' Seasons Readings with a giveaway! Every day for the next month we will be giving away books. All you have to do to enter is leave a comment on the blog, with your email address. 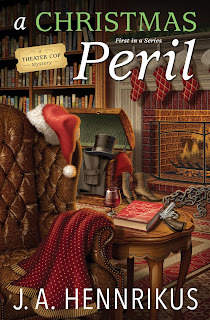 I am happy to give one randomly chosen winner a copy of A Christmas Peril. I will choose a reader Friday at noon east coast time, and will contact them for their address. We are so grateful to our readers, and happy to celebrate with them for the next month! Sounds wonderful. Thanks for the chance to win. Tech week! Sounds like a great setting for a holiday mystery! Thanks for the chance to win! That sounds a bit like our Thanksgiving this year. I have a grand-nephew's Bar Mitzvah in the morning. We've assigned which of our guests is bringing what and included the extended family in the potluck part. So besides the turkey and sweet and sour meatballs that we make, we also have a meat lasagna coming. One of our son's friends who we "assimilated" into the family is a C.I.A. trained baker and is in charge of the deesserts (He works for B&H Photo no less). Sounds like a good book! Always looking for new and different series. mcastor07(at)gmail(dot)com. This sounds great! Love the theatre aspect! Season's readings and season's greetings to you all. This would be a new series for me. Thanks for the opportunity. Sounds like a wonderful potluck. Would love the recipe for bourbon sweet potatoes!! Sounds like your potluck feast will have something for everyone attending. Fabulous... the Bourbon Sweet Potato Casserole sounds like da bomb diggity! Happy Thanksgiving! I'd like to attend that feast of yours, it sounds pretty delicious and lots of fun. Christmas mysteries are so fun! Good luck to all entering, this is a great book! "A Christmas Peril" sounds like a great read for this time of year. Would really enjoy reading. Your Thanksgiving plans at the theater sound wonderful, wish I could come with all my folks. 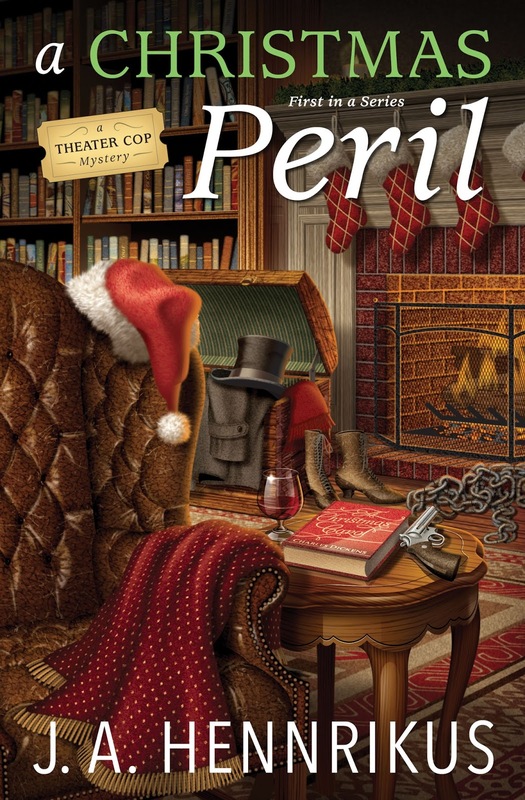 "A Christmas Peril" sounds like a fun read for the holidays. Thanks for the chance to win. I'll buy a copy then I'm sure to win. LOL My address:gheruska44(at)gmail(dot)com. This books sounds really good. Thank you for the giveaway.! 'Tis indeed the season and I love it. I love Christmas themed mysteries. Thanks for a chance to win. Happy Thanksgiving!! Potluck for Thanksgiving sounds great - if you skip the tofu!! Thanks for the giveaway! Your book sounds like a perfect cozy read. I need to request it from my library. Thanks for your generosity and the chance to win a copy of A Christmas Carol. Sounds like a wonderful feast to me! I remember working all the holidays, in theatre, law enforcement, and mental health. I still work, but my new title allows me the main holidays off. So I'll spend Thanksgiving with my parents this year-but back to work on Black Friday! I loved your last book and I am thankful for a chance to read this one. Happy Thanksgiving. Great title and cover! This is the kind of book I like to read. Looking forward to reading "A Christmas Peril".